Purpose: Use this document to view detailed receipt information in ctcLink. This page and the pages that you can access from it enable you to inquire on the same information that is available through the Maintain Receipts - Receiving page and the pages that you can access from it. 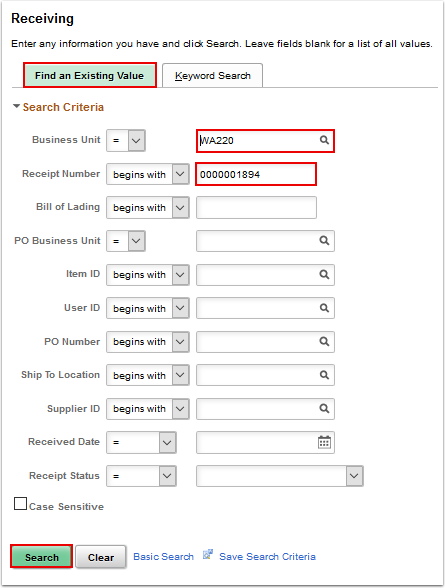 On the Receiving search page, select the Find an Existing Value tab. Select Search. The Receipts page will display. On the Receipts page, select the different tabs to view additional information about the receipt. Select the More Line Data tab. On the Receipts page, select the Optional Input tab. On the Receipts page, select the Receipt Lines tab. On the Receipts page, select the Header Details link to view receipt header details. The Header Details page will display. Use the Header Details page to review the receipt header details. Select Return. The Receipts page will display. To view line item information, first select the desired item by checking the Sel checkbox for the item to be viewed. Select the Line Details link. The Line Details page will display with the information for the Receipt Line selected. On the Line Details page, select Return. The Receipts page will display. On the Receipts page, select the Line Status link. The Line Status page will display. On the Line Status page, view the details about the status of the receipt. Select Return. The Receipt page will display. On the Receipt page, select the Distribution link. The Receipt Distributions page for the line selected will display. In this example, the Receipt Distributions page for Line 1 page is displayed. 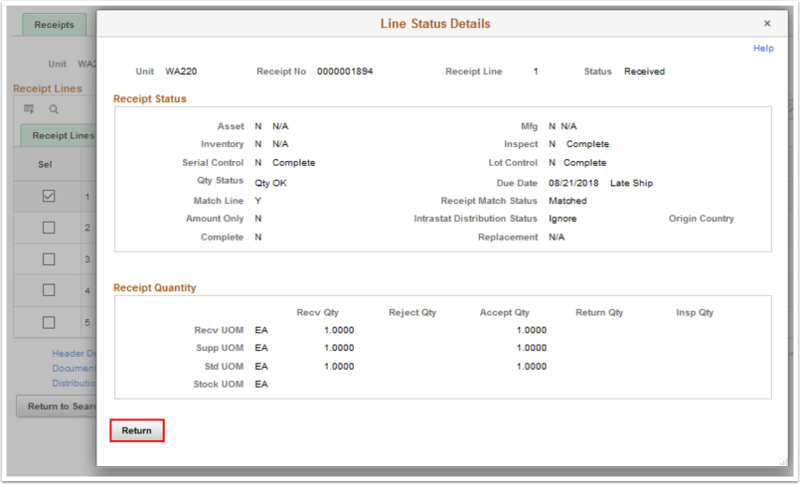 On the Receipt Distributions page for the line selected, view the distribution information for the receipt line. 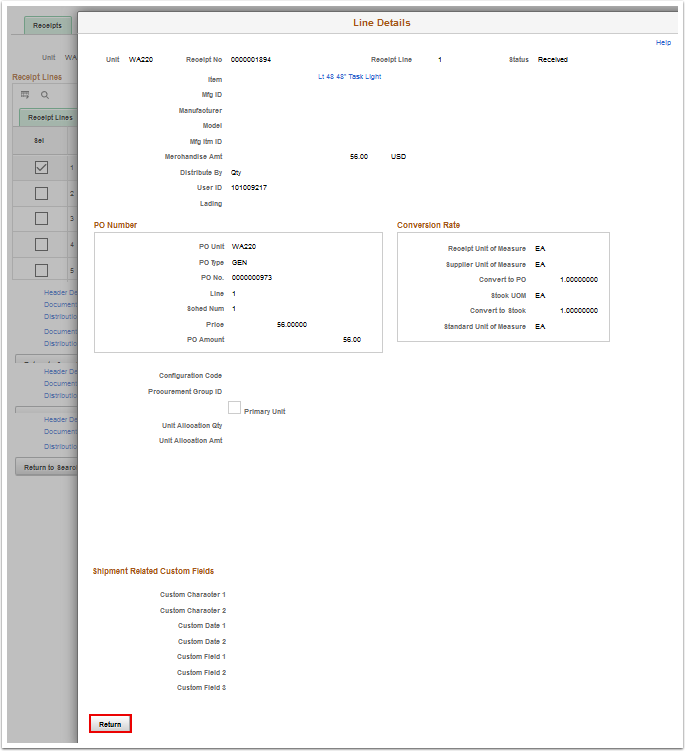 To view purchase order distribution information, select the checkbox for the line. 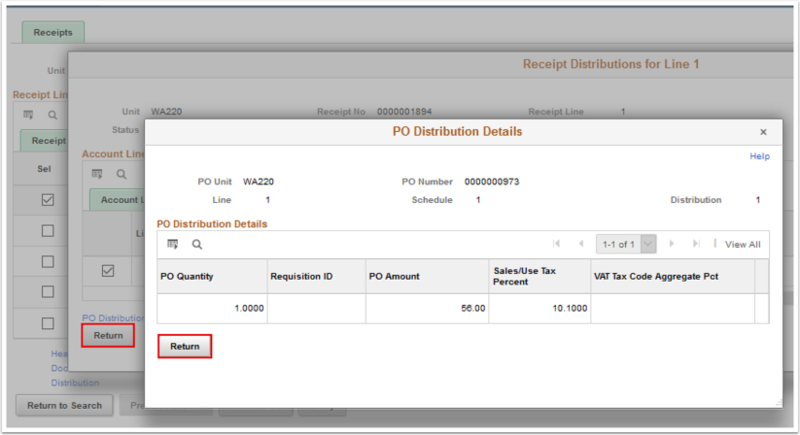 If the PO Distribution Details link is active, it can be selected. The PO Distribution Details page will display. On the PO Distribution Details page, select Return. The Receipt Distribution page will display. On the Receipt Distribution page, select Return. The Receipts page will display. On the Receipts page, select the Asset Information link. The Asset Management Information page for the line selected will display. 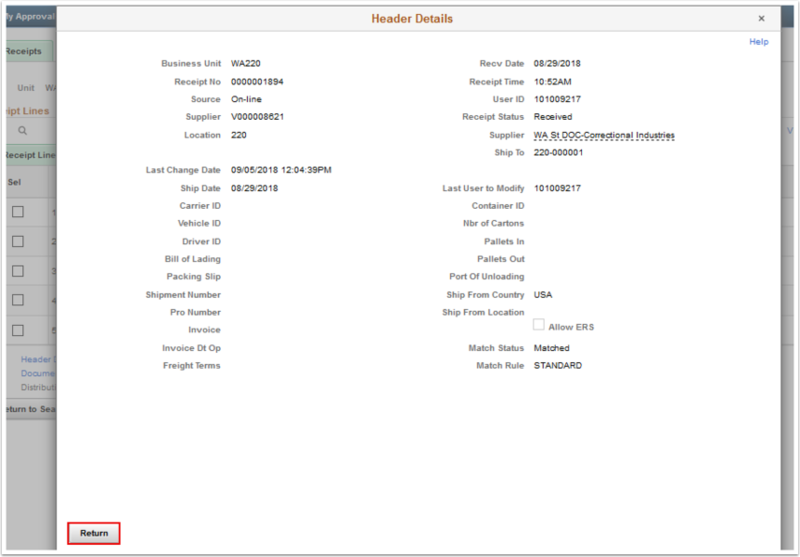 In this example, the Asset Management Information for Line 1 page is displayed. On the Asset Management Information page, view information about asset purchases.